I thought it was time to do a little round up of ten social media apps and sites that may just become the next big thing. It is interesting that while the first wave of social media sites focused on networking, these have a slightly different approach. Many have strong networking elements, but they also incorporate a lot of mobile technology and the companies behind them are perhaps much more focused on developing business models that generate revenue from day one than their predecessors. This is without a doubt the hottest property in the US web scene at the moment. It has the backing of some serious investors and is starting to gain a very large following who are spending real money on the site. So why haven’t you heard of it? Well Groupon works by offering discount deals on goods and services in specific cities. And so far the company has focused on the US – the London launch is apparently months away. The really clever bit is that the day’s offer is only activated if enough people get together in a group and agree to go for it. So, for example, to get a 70% off deal from a hairdressers you might need to get 100 people to sign up for the deal. And you do this by spamming/sharing the offer with all your mates on Twitter and Facebook and via email. Businesses love it as they can guarantee a certain amount of business while getting a huge dollop of social media PR at the same time. With a very obvious hole in the market a host of UK companies have launched their own Groupon rivals. The most noteworthy are Snippa and Groupola. Neither though has so far delivered enough really cool offers to turn heads. The good news for them is that if they can get it right there is more than enough room in the market for several of these services. There are also a lot of cities in the UK. Northern entrepreneurs really ought to be on the case here. The concept could even go hyper local with smaller communities in large cities having their own offerings. This will be very, very big. There are a lot media companies and indeed bloggers with large followers, who would love to have a presence on the iPhone and the iPad. That’s where Appmakr steps in. This controversial US company enables anyone with content to easily create an iPhone app. Think of its as the WordPress of iPhone apps. There are however several catches. Firstly you still have to pay a fee – the entry level basic service is $199. Secondly there are rumours that Apple is about to crack down on RSS content only apps in the near future. The argument runs that the apps don’t ofter anything than the websites/blog, which is easily accessible via the iPhone anyhow. Conspiracy theorists point to Apple’s cosy relationship with big publishing houses as being the real reason it is slightly sniffy about content driven apps. After all how many dreadful games are there on the platform? This however might prove to be Appmakr’s big opportunity. If it can develop basic apps that cost little yet add features such as retail or location based services as well as content it might keep Apple happy and generate a whole new way for smaller media companies to make money. In many ways this has already gone mainstream with features in the media as well as an odd marketing campaigns from French Connection. However I think Chatroulettte could mature in 2010 from being a service that is the preserve of exhibitionists through to one that enables people to make real connections. In case you missed the hype Chatroulette is little like video Skype but with a genius twist. You switch your webcam on and start having a video conversation. What makes it interesting is that the person you speak to is chosen at random. What has made Chatroulette notorious is that some users say that as many as one in ten of the people they encounter are naked men. Ever the optimist I believe that people will get bored with this, or maybe even Chatroulette’s developers will work out a way of weeding nakedness out. Then it is very likely that people will find real uses for the services. Think speed dating. Or even niches. I might be want to speak to a group of Arsenal fans after a game and if I specify that request I could be chatting to Mikhail from Moscow about the Russian Gooners appreciation society. Think too how it might work if it were incorporated into a TV and you could talk with randoms about live events. 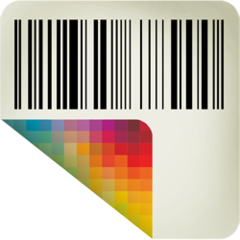 There’s a full review here but the gist of Stickybits is that it allows you attach any kind of content – images, words etc to a barcode. So now if you scan the barcode of the Crunchy Nut Flakes in our kitchen you get to see a pic of my daughter along with an audio message telling her father that the CNFs are hers and I need to open the Bran Flakes instead. Where it might score in the future is that you can buy a kit to add your own barcodes to things. At the moment these are a bit pricey. But imagine if you could leave barcodes in public places where you could then access information or cheeky messages – that would be fun. For me though the optimum use would be having a barcode in a business card. When the users accessed it they could then get an audio message, some video, and some text which explain in much more detail about who I am and what I do. Stickybits is clearly great fun and there are loads of features to explore, but it does strike me as an app in search of a killer feature. Cleverly Stickybits are using the community to come up with ideas which strikes me as a very sensible idea. Out of the top ten Foursquare is perhaps the best known and most popular in the UK largely because it is already been championed by a significant section of the British social media Twitterati. The one thing it doesn’t have in its favour is that it is not that easy to explain. In fact in many ways until you use the service you probably think it sounds a little well, rubbish. It is built around an app which is available on many mobile platforms. When you fire up the app you get the opportunity to check into the place where you are. So if I an in cafe I check in and I get awarded some virtual points by Foursquare. 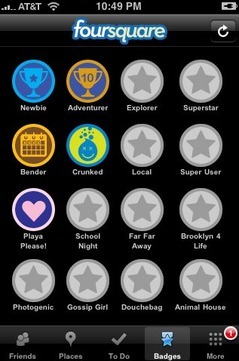 I then compete with my friends to see who can get the most Foursquare points during a week. It does sound dreadfully sad (like a weak mobile version of Top Trumps), but believe me it is very addictive. The game also has lot of social features, so you can add comments about the places you visit. It also hooks up nicely with Twitter so you tweet about where you are and what you are up to. However in spite of geekiness Foursquare is growing very quickly. Brands have also started to take it seriously. 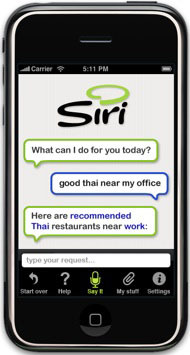 Soon it will be commoun to check in at places using Foursquare and get free offers etc. Some far sighted UK brands have been doing this already. I can’t quite see Foursquare ever really emerging as a social network to rival Facebook or as a serious reviews site either. It is however lots of fun. Given my passion for blogging I had to include one content platform in the top ten and inevitably it goes to Posterous as I use it almost every day. 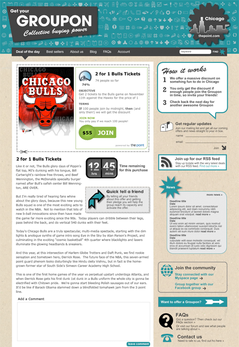 This service, which began nearly two years ago now, enables users to blog very quickly and easily either by sending an email with the post and the picture included, or by using a very clever bookmarklet that lets users instantly grab an image on a page and then opens up a text box for them to get typing. The other clever bit is that once our post is up Posterous can send a link to any number of social sites including Twitter and Facebook to entice readers. Posterous also has a very simple to use iPhone app too and quite a few high profile US bloggers are very vocal about the format. It also has a rival called Tumblr, which is aso excellent and works in a similar though slightly more complicated way. Unluckily for Posterous several of its key features have now been incorporated in mainstream blogging platforms like WordPress and Typepad, but Posterous is still growing very nicely and I would put money on the developers once again delivering some killer new unique features in the not too distant future. One of the most talked up technologies of 2010 is Augmented Reality. AR browser Layar lets you overlay a layer of digital content over external reality as seen through your phone’s camera. Point your phone’s camera at a street/building/person, and on the screen, information about what you’re seeing is overlaid onto your view of it. With Layar any developer with a bright idea can add their own layer of content. There’s a Wikipedia layer for location-tagged Wikipedia entries, a find-an-available-house layer called Funda set up by an entrepreneurial Irish developer with an interest in property, and a bank has done one marking all nearby ATMs. 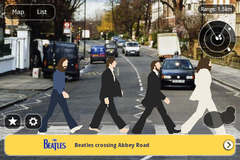 There are also some fun apps including one that offers a very cool Beatles virtual tour of London. A lot of developers are working with Layar now and there are apparently over 400 apps for it. A lot of brands have taken notice too, so expect to see a rush of AR apps in the not too distant future. There are lots of apps that enable you to stream video from your mobile, Qik, for example, has been around several years.Twitcasting uses social media to take live streaming onto another level. After downloading the app, link your Twitter account to Twitcast site by signing in here and then shoot away. 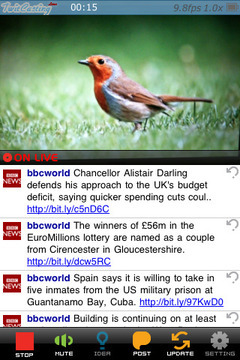 The screen on the Twitcasting app is split into a video recording screen and a twitter feed. Hit “Go Live” to go live and as you shoot the video a text box pops up suggesting you post a link to livecast to twitter. Any of your followers can then click on the link and go over to your video channel on the Twitcasting site – just the same way that TwitPic works. The livecast switches off if you receive a phone call. The website grabs @replies on Twitter and posts them as comments under the video – it’s pretty cool, it also archives your videos just like Twitpic does with pictures. Twitcasting might not be a huge mainstream success but some of its features are sure to be incorporated into other video sites very quickly. Kobo is a really good idea that makes a lot of sense for those who love electronic books. 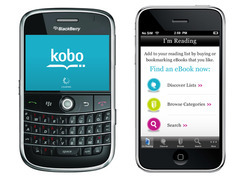 Unlike rival services Kobo sets itself apart from other digital book stores by offering a synchronised eBook library across a number of gadgets, from smartphones to netbooks. For instance, if you’re lucky enough to own an iPhone, an e-reader, a tablet PC and a desktop PC, Kobo will use cloud storage to sync your library across multiple devices, meaning your page is kept whatever you’re reading the eBook on, as well as giving you access to all your novels at any time. It has just launched in the UK, boasts a huge library of titles and best of all has a lot of the classics for free. really nice, handy site. Log in with one of your accounts. Add your favorite links and background aswell. 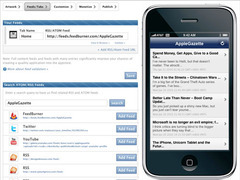 Many software had been launched from iPhone in the year 2010. Groupon is the best application of all the 10 that have been listed out here. Thanks for the update. Groupon is simply the best for local deals and its growing at a very high rate in popularity. Most of my friends use Groupon to get the latest update on local deals. Thanks for the Great post. I totally agree with your view on Kobo – a great addition to a mobile device. I would like to submit my website http://www.burnitorsendit.com as one of THE hottest new sites!! Check it out and let me know!! I read this article as the samsung auto-start video adverts kept making the internet browser freeze needing shut down and restarted (i’m using internet explorer 8): i detest auto-start music/animations/videos on sites. Great , I have come to the conclusion that if I want to search apps on my laptop, I should use other marketplaces. iPhone for example has a very limited approach because you have to download the iTunes Store (hate that). I have come to the conclusion that if I want to search apps on my laptop, I should use other marketplaces. Groupon is a great site for local deals. Have anybody of you heard about Good Hotel Guide app? I use this web site, it’s really grate and helpful but I’ve never used IPhone apps before… I travel a lot so I guess it can be very useful for me. Do you know where I can buy this app? Moodler is a mood tracker for your social network, that’s also useful to conduct snap polls on a topic. it took 5 attempts to open this page from your twitter link to read this article as the samsung auto-start video adverts kept making the internet browser freeze needing shut down and restarted (i’m using internet explorer 8): i detest auto-start music/animations/videos on sites. after all that although the article was good it fell well short of compensating for all the effort involved repeatedly trying to open the site over and over again to try and pause the 3x samsung video adverts fast enough to prevent the browser freezing again to be able to try to read the article.